We here at Mom To Grandma have a wonderful sponsor! Build A Dream Playhouses is giving our winner their choice of the Cosmic Cruiser or the Dream Machine, YAY! Per sponsor request, those having previously won from Build A Dream are not eligible. Build A Dream joined Facebook on September 15th, 2010. Their commitment has always been two fold. Both to the creativity of children and to the environment. Their products are 80% recycled in the beginning when manufactured and when they are totally finished, and the children no longer have any purpose for them they are 100% recyclable. They are manufactured just 38 miles from their distributor which saves a lot on fuel - not having far to ship them! 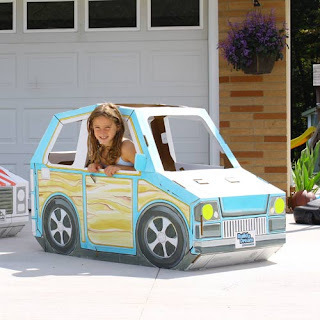 As for the creativity of children these over sized shaped card board boxes are every child's dream. What child at some point hasn't pretended his cardboard box was a train or spaceship or kitchen? I remember my children wanted the biggest boxes I could get. When I did get a really big one and they decided to play together with it - Wow, what imaginations were used! With Build A Dream Play Houses children can imagine and create until their little hearts are content. They can color, use markers, paint anything they please and you as the adult allow. My grandchildren received the Cosmic Cruiser. It was delivered very promptly. A package for them, yay! They were so excited knowing they could decorate it anyway they wanted. Mom was happy knowing she could let them color, paint, stamp, draw and use their imagination anyway they wanted and in the very end it would be recyclable. There are different stages of play with BUILD - A - DREAM . It comes in the mail that causes excitement on its own! Next they get to decide how they want it to look. The color of it, the way it is designed, stars n stripes, squares, circles, polk a dots, many different drawings or even all one color. They choose what methods they use to create their piece of art. When they have it just perfect they fold it into it's shape and play with it as the play piece it was intended to be. Mission At Build a Dream Playhouses, we strive to deliver safe, affordable, eco-friendly products that stimulate and encourage the endless imagination of ALL children. Our quality products offer the tangible framework for children to place their intangible dreams. 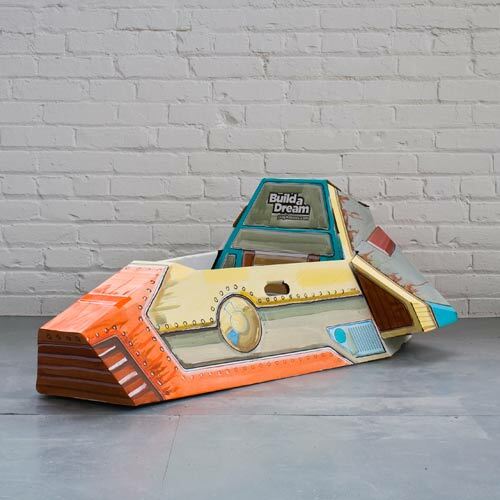 Company Overview Build a Dream Playhouses was founded by a Cleveland father dedicated to the futures of the City of Cleveland, the State of Ohio, and the imaginations of children. In collaboration with the world famous Nottingham-Spirk Design Associates, a group of 3 to 9 year old children, and the Smurfit Stone Container Corporation, Build a Dream Playhouses is now proud to introduce to you what we believe to be the most innovative, fresh, and fun playhouses on the market. We hope you enjoy our products and we look forward to introducing many more in the near future. Must be 18. US only, sorry friends! Per sponsor request - those that have previously won are not eligible. Please give the raffle copter a moment to load. Good Luck! a Rafflecopter giveaway Disclaimer: These are my opinions and may differ from your own. Winner has 48 hours to respond to winning email. According to Jenny, So Easy Being Green, the Blogging Mamas Network, and the Under the Rainbow participating bloggers are not responsible for sponsors who do not fulfill prize obligations. I will enter any of them. ^^ If I had to choose I'd enter toddler giveaways because I'm always looking for things to help with my son. I enter both baby and preschoolers because I have two kids--they grow out of things so fast! I am most likely to enter a baby or child giveaway. Or a mom giveaway. I like the adult giveaways the best. I enter both adult and children/baby giveaways. Adult or Baby... Adult for myself and hubby... Children's giveaways for my nieces and nephews... I love giveaways in general.